Santorini Travel Guide gives you handy information on the city and the interesting things you can do in and around, like organized tours and cruises, vacation packages and short walks. In Santorini, every single stone has its share of glory. A glory arising from the grandeur of its landscape. Santorini is not easy to describe. Santorini is not comparable with any other Greek island. What makes it so different from any other island, is its imposing landscape, the caldera with its impressionistic contrast of colours, its terrifying birth... Santorini is a small island, located at the south end of the Cyclades island complex. Her name is officially Thera but Santorini is what the island is called most of the time. She is positioned between Ios and Anafi, 130 nautical miles from Piraeus and 70 nautical miles from Crete. She covers an area of 96 km2 and has a total coastline of 69 km. There are almost 11.000 people living here, but in the winter the population drops to 6000. The western coastline ends up brutally meeting the famous Santorini caldera. A big basin covering approximately 32 square miles the depth going from 300 to 600 meters. At the western end of the caldera, we find the island of Therasia and an inhabitant island, Aspronissi. By taking a good look at those three islands we can easily distinguish a virtual borderline of what used to be there before the caldera was formed. In contrast to the sheer cliffs at the western part, the eastern side of the island consists of endless stretches of beach covered by sand or shingle where someone can enjoy the sea swimming in the clear blue waters of the Aegean. From the port of Skala the visitor can reach the capital Fira with cable car, donkey or by walking up the hundreds of stairs. 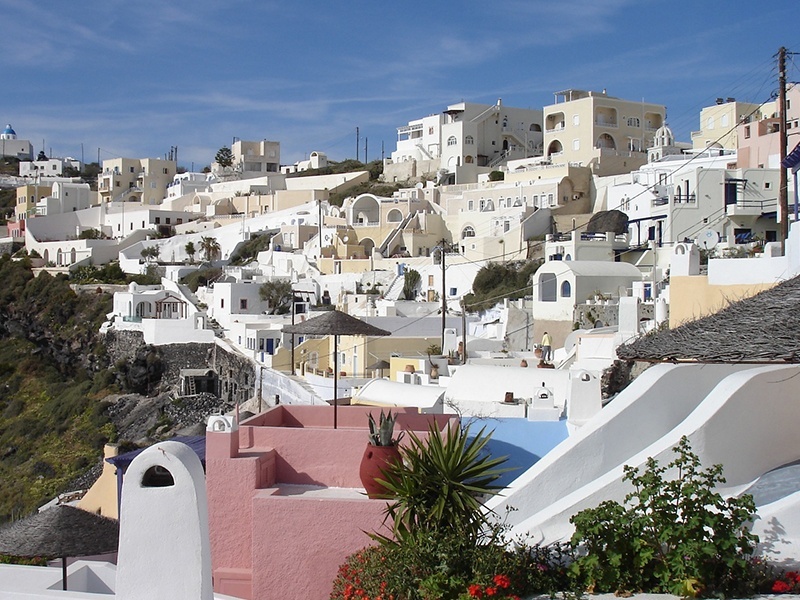 Fira is a cosmopolite city with night life and famous cafes for day and night. But the best to enjoy here is the most beautiful sunset from the Caldera, which has been the inspiration of many artists due to its magnificent location and superb view having just in front of you the volcanic island and the Aegean Sea. The city is also full of jewellery and fashion stores where pieces of fine art in gold are sold together with clothes of world famous fashion designers. Famous galleries expose here the works of many artists inspired by the beauty of the island. Santorini has many beaches where you can find lots of organized sea sports including sea diving. Also in many hotels you will find sport campus and in those on the beach sea sports. Santorini is a stood here for thousands of years and is proud for her history and glory that her inhabitants gave her. In the archaeological museum there are many pieces showing this long history but the Akrotiri is the history itself. Situated at the southern part of the island, with ruins of a Minoan city destroyed by an eruption of the island's volcano around 1500 BC have been uncovered. Many two and three-story buildings, town squares, workshops etc. were found buried under the volcanic ash, like a prehistoric Pompeii. Lots of bars and night clubs all over the island, in and out of the hotels, give you the opportunity to enjoy this famous island. Your night starts from the world unique sunset over the caldera and continues as long as you like in many places offering from romantic dinner to life music with local and international taste. Cruise Greek Islands Turkey Aegean Jewels cruise to Greek islands of Mykonos, Patmos, Rhodes, Crete (Heraklion), Santorini and to Kusadasi in Turkey. Cruise Greek Islands Turkey Aegean Legends cruise to Greek islands of Mykonos, Patmos, Crete (Heraklion), Santorini and to Kusadasi in Turkey. You will visit the cosmopolitan Mykonos, the famous ancient Ephesus in Turkey, Heraklion in Crete and and the world famous island of Santorini with the best sunset on the volcanic islands. Greek Islands Turkey Cruise is the most famous on east Mediterranean covering 6 Greek islands and 2 cities in Turkey. 8 Days full of history, culture, crystal clear waters, plenty of places and on board entertainment combined with fine Mediterranean and Greek food. This Greek Islands hopping tour gives you the opportunity to enjoy the sea and the sun visiting as many islands as possible and get a good taste of them. This is low budget tour for those they want to see more in short time and are not willing to pay too much. Balanced combination of Turkey and Greece. Visit Istanbul and all of its famous monuments in one full and two half-day sightseeings in the greater area. Get to know Athens and visit the Oracle on a full day tour to Delphi. A perfect combination of Istanbul Cappadocia Cairo. Admire the famous Istanbul monuments, the Museum of Anatolian Civilizations and the Mausoleum of Kemal Ataturk in Ankara and the famous Cappadocia area and then Cairo and the Pyramids of Egypt. Enjoy the nightlife in Mykonos and the sandy beaches, the clean beaches and blue Aegean Sea waters of Paros and the best sunset in Santorini and the Greek food in all islands.